On this 15th day of the 9th lunar month when the moon is supposed to be at its brightest and fullest we celebrated the Mid-Autumn festival in a simple way. After all, we had just hosted 2 mooncake baking parties and given mooncakes to our neighbors just after the earthquake. We decided to ride the bus downtown to the bookstore. Previously, our bookstore had a nice selection of bi-lingual books. Today: nothing. Not one single one. Of course, they offered us the English textbooks, but we assured them our English was fine. Next, we headed to a new bakery. The kids love to watch the bakers decorate cakes. Schäfer and Sianna each chose a treat. (Hubs: they had a rather good selection of cheesecake, believe it or not!) I managed Selah who wanted to crawl everywhere, but was contained in my arms. We took the bus home. Ate pot pie. Put the kids down for naps. etc. It started way back in the year 1998. This was the year I had my first mooncake and decided that something had to be done. 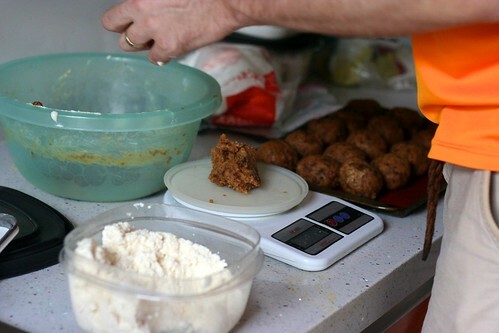 Of course, at that time I had neither the resources or the time to put into an “expat-friendly” mooncake. This year, after having built up a repertoire of skills and relationships needed to accomplish the task, I went for it. First step: Make cream cheese. 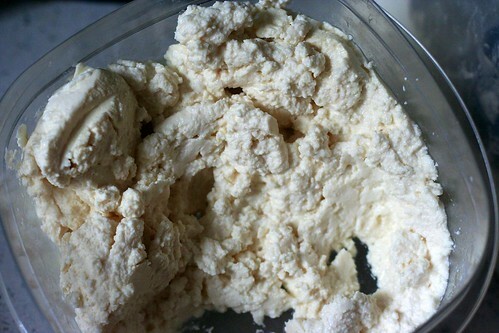 Of course, we lacked real cream and instead opted for ricotta cream cheese + a little salt + smoothing out in the blender. For our purpose, it worked. 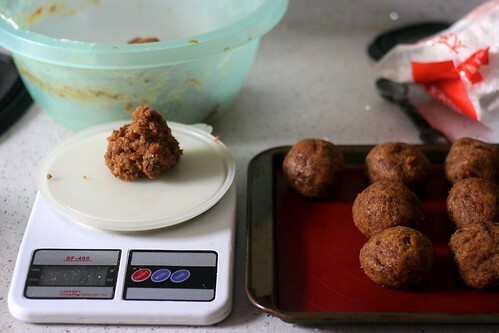 After making a cake, crumbling it up, mixing it with cream cheese frosting, I weighed out 85gram balls and refrigerated them. At this point, I was basically making a cake pop. 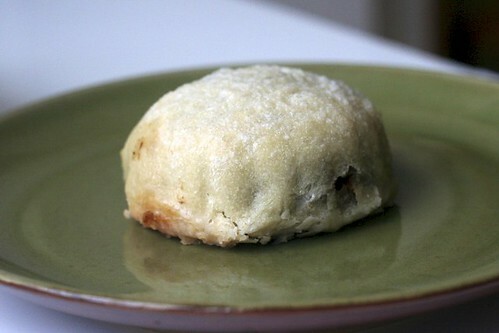 Once the balls were cool enough, I wrapped them in mooncake dough, pressed and baked them. The pumpkin spice mooncakes turned out delicious! I think somehow this batch of “crust” got a little too moist in the refrigerator so it did not hold the “hope” character as well as I would have liked. It was our only batch of dough to turn out this way. Next year: Apple pie and pumpkin pie mooncakes. The trick will be figuring out how to wrap the dough and press them. Well, we have a year to prepare, eh? 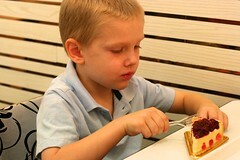 I snapped a photo of the kids eating the last of the mooncakes. Until next year! Schäfer is a fan of all mooncakes. He loves them. Schäfer said, “Sianna’s name is Tian Yue – is that like the moon?” I explained that it was the same sound, but a different character. He replied, “If her name was Yue like the moon then we could call her mooncake for a nickname.” I honestly think it would fit her because mooncakes are so little and sweet – just like Sianna. Sianna enjoys about 1/2 a mooncake and then she is done. 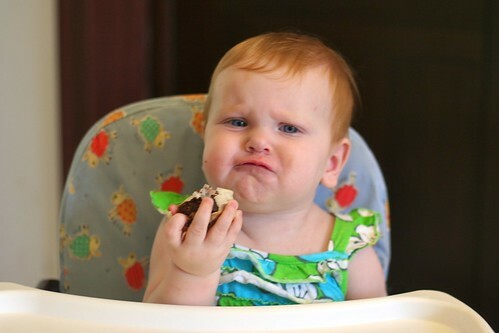 Selah tried her first mooncake. 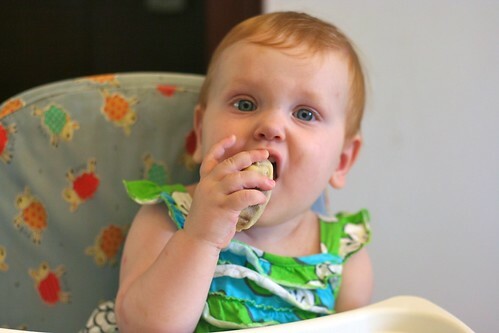 She wasn’t a big fan – but that could be because she prefers applesauce and pureed cauliflower! Selah’s face in the last picture made me laugh out loud… For the first time today. Yep, it’s been one of those ‘I-wish-I-was-homeschooling-instead-of-teaching’ kind of days. THIS IS AWESOME!!! I am inspired to start planning for next year. Thanks for all of the info on DIY mooncakes. P.P.S. The picture of Selah at the end is ADORABLE! Love it! way to keep us on our toes… and our tongues wagging shorel! but i must admit, my favorite part about this post was the matching outfits the girls are wearing! absolutely love them! oh yes, also love the look on selah’s face! Love that expression in the last photo! And Sianna is looking so grown up these days. It happens so fast.